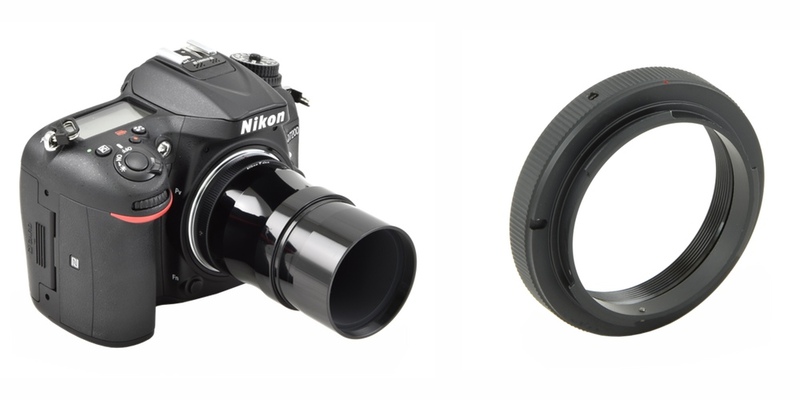 The Nikon T2 ring is one of the most important accessories that you need to record astrophotos with Nikon DSLR. In fact, this accessory converts the Nikon bayonet in an universal T2 thread (42x0,75 female) allowing you to connect a variety of accessories such as photographic adapters, off-axis guiders or focal reducers. With this accessory, you can use the telescope like a powerful lens of your camera! The Nikon T2 ring is one of the most important accessories that you need to record astrophotos with Nikon DSLR. In fact, this accessory converts the Nikon bayonet in an universal T2 thread (42x0,75 female) allowing you to connect a variety of accessories such as photographic adapters, off-axis guiders or focal reducers. With this accessory, you can use the telescope like a powerful lens of your camera! In order to use the Nikon T2 ring, you have to remove the lens from your camera and connect the T2 ring, just as if it were another lens. In this way you have, in front of your Nikon, a T2 thread that is used to connect the camera to your telescope or other photographic accessories.